The Iran Review period expires on September 17, and dead-ender Tea-Publicans will not accept their defeat. Senate Democrats on Tuesday blocked another vote on a resolution disapproving of the Iran nuclear deal, reprising the result of a vote last week. Senate Democrats Again Block Vote to Reject Iran Deal. Multiple House Republicans want Senate leaders to “go nuclear” over the Obama administration’s deal with Iran now that Democrats have stymied efforts to derail the accord by conventional means. A small but growing number of GOP lawmakers say that Senate Majority Leader Mitch McConnell (R-Ky.) should invoke the “nuclear option” to change Senate rules and prevent a filibuster on a resolution to kill the deal. Their angst is intensified by their belief that Democrats will likely be able to block legislation withholding federal funds from Planned Parenthood, a standoff that increases the chances of a government shutdown. Less than two years after Republicans railed against Democrats for changing the rules to prevent filibusters on most presidential nominees, McConnell has ruled out using the nuclear strategy. But the call puts more pressure on the majority leader and illustrates Republicans’ growing frustration with their inability to score significant victories in Congress, even while controlling both chambers. Texas) — chairman of the House Science, Space, and Technology Committee — is currently circulating a letter among fellow lawmakers with a similar call. “Some pieces of legislation, like the Iran nuclear deal, are simply so consequential that they demand revisions to the Senate’s procedures,” Smith wrote in the draft letter. McConnell previously faced some pressure to change the filibuster rules during a fight over immigration earlier in the year. Now remember, when Republicans were in the minority in the Senate, it was Mitch McConnell who demanded 60 votes for virtually everything and Tea-Publicans engaged in an unprecedented abuse of the filibuster in pursuit of McConnell’s strategy to “just say no” to everything that President Obama proposed. McConnell cried big turtle tears when Democrats threatened to do away with the Senate filibuster rules due to the unprecedented abuse by the GOP. Eventually both sides agreed to a compromise. 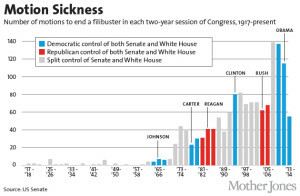 Democrats have used the filibuster sparingly by comparison since Republicans regained control of the Senate. Tea-Publicans are authoritarians. They will use the rules to their advantage when it suits them, and then change the rules when it does not. It is always about getting their way. [T]he furor over the Iran deal has opened the door to wider criticism. Republicans say the rule change would just be a natural extension of Democrats’ decision in late 2013 to prevent filibusters of presidential nominees except for those to the Supreme Court. Now, some Republicans say, it’s merely time for Democrats to reap what they have sown. “If Minority Leader [Harry] Reid [D-Nev.] was willing to use this tactic to push through something as simple as judicial nominees despite the objections of Republicans, it is time that Republican leadership utilize the procedure as a matter of national and global security,” Palazzo wrote in his letter. Still, they acknowledge that even making the change would ultimately fail to scuttle the Iran deal, because President Obama could veto the legislation once it got to his desk. So what’s your point? Acknowledge your defeat and move on. Time’s up. Sen. McCain hedged his support, warning that it “would set a dangerous precedent” and open “charges … of me being a hypocrite.” Yet the seriousness of the Iran deal “argues for us to look at any possible option that we can,” McCain said. Still, McConnell has no plans to explore the idea. “He does not support the nuclear option,” spokesman Don Stewart told The Hill in an email. As McCain made clear in his radio interview, Republicans excoriated Democrats for changing the rules in 2013, and would open themselves up to charges of hypocrisy if they followed suit. 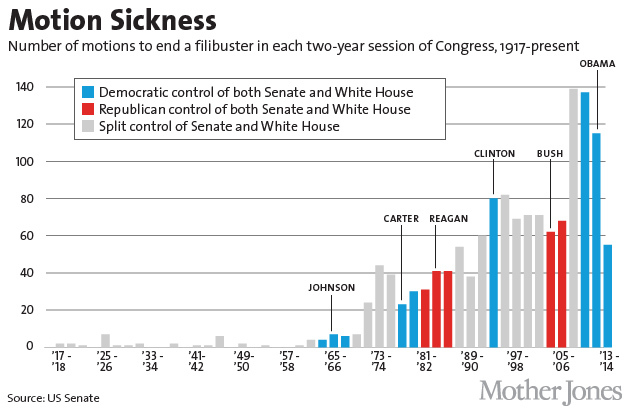 Not to mention the likelihood that someday, Republicans will no longer be in control of the Senate. McConnell has threatened additional votes on the Iran deal that may be compromising for Democrats, but he has remained steadfast on the filibuster threshold. Senate Majority Leader Mitch McConnell (R-Ky.) [warned] Democrats that if they block a resolution disapproving the Iran nuclear deal, he will force a vote on a contentious amendment related to Israel and U.S. prisoners. [T]the Republican leader will file cloture on the amendment, forcing a procedural vote later this week. Key Democrats who support the deal, as well as the Obama administration, have argued that the Iran debate should be focused only on the country’s nuclear program, and not other contentious areas including the country’s support for terrorism. The Honey Badger, Senate Minority leader Harry Reid, says “We’ve seen this strategy gimmick before, it never works.” Reid suggests Dems will block Israel amendment. Senator Debbie Stabenow (D-MI) accused McConnell of ‘playing politics’ with American hostages, something Republicans have done since the Iranian hostage crisis of 1979. They have no shame.